Sejuti Mourin: Teachers and employees of non-MPO educational institutions, have began an indefinite hunger strike protesting for enlistment under the government’s Monthly Payment Order (MPO) facilities. 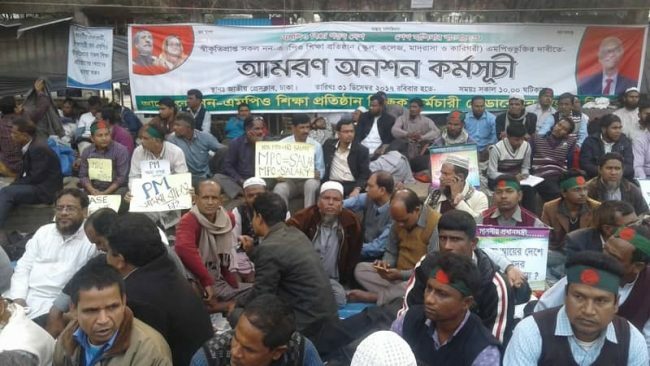 Hundreds of teachers and employees under the banner of “Non-MPO Shikhya Pratishthan Shikhyak Karmachari Federation” gathered in front of the National Press Club at 10 am yesterday. Earlier on Sunday, non-MPO Shikhya Pratishthan Shikhyak Karmachari Federation General Secretary Principal Dr Binoy Bhushan Roy announced the initiative, demanding the enlistment of their educational institutions under the MPO facilities. More than 7,000 teachers and staff of such institutions had been protesting since June 10.